I can’t, because the “new” text next to posts is a similar color to tags as rendered on list views. I don’t have a link to an answer on how to do that at the moment, but it would be helpful to me if we distinguished the colors for those two features. Uhm … I’m not sure I follow… None of the posts in your screenshots is new to you. They’re all purple-ish, meaning you visited those URL. And you don’t have unread messages in those topics, meaning you are not following them or(and) there are no unread replies. Below is a screenshot I just took: see the topic Why DreamObjects... is blue-ish and there is a blue circle with 3 in it? That’s because I am following that topic (default since I commented on it) and I have not read 3 messages. Feature Request... and DreamPress with ... also are threads with a new reply in it. 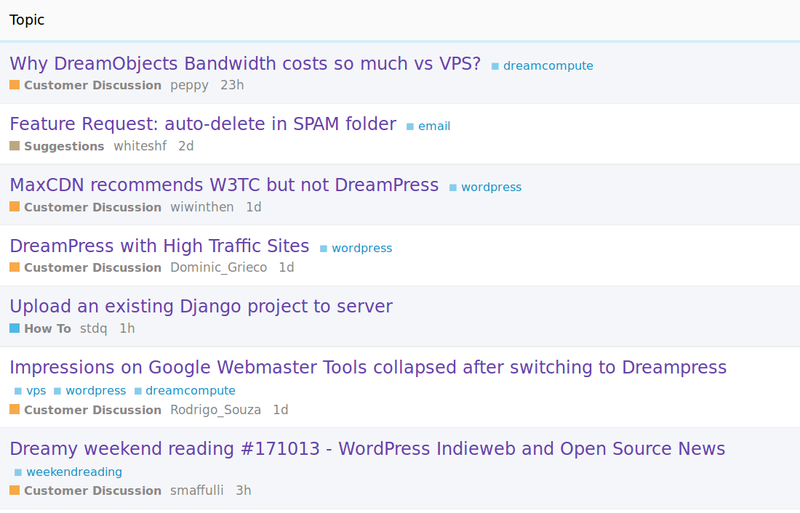 There could be a glitch in the css though: which topics did you not read of the ones you posted? None of the posts in your screenshots is new to you. That is how they look by default on all Discourse instances. 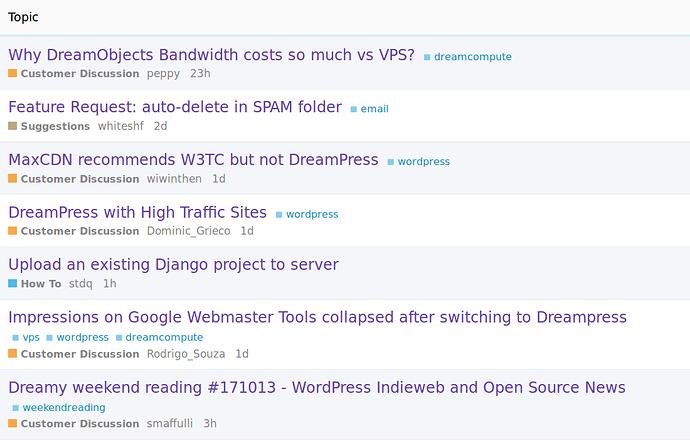 See how it looks like way tags render next to topic titles on this instance? I see what you mean… I’ll pay attention next time a new topic popus up and look at the css. To get these notifications, I think you first have to setup Category or Tag watches in preferences (/u/user/preferences/categories). Personally, I just use RSS or new-topic email-notifications on Discourse forums, so I don’t have to visit the site regularly to stay informed. Nice! Very popping! Let’s try it out for a bit, and I’ll make a suggestion if I have one. But I think that looks great, personally. Thabk you for this link!